Many people are being denied tickets because of availability. Cleveland being a larger venue, accommodated more fans. Pittsburgh was a poor choice. I think they have to deny a lot of fans every year because of this same problem. It is very hard to get tickets to the NCAAs unless you can get them the first day they go on sale. That’s what makes college wrestling fans so great. I'm predicting a whiplash effect. Prices are prohibitively high right now because brokers are assuming high interest and high attendance due to the PA location, but there will be a glut of tickets available the weekend of when people are scared away due to the high prices. If I'm right, y'all will see me in the front row; if I'm wrong, will be watching ESPN from my hotel room Sat. night. While I think that there is a legitimate ticket problem because of the smaller arena, I think a lot of the "issue" is that people have learned that they can request tickets from a bunch of different schools. I bet 2nd hand ticket prices crash the week of the tournament. That's what I'm hoping for. I live 25 minutes from the venue and I can't get tickets at a reasonable price. Even one of my best friends who sells tickets for a living can't get me anything right now. I'm predicting a whiplash effect. Prices are prohibitively high right now because brokers are assuming high interest and high attendance due to the PA location, but there will be a glut of tickets available﻿ the weekend of when people are scared away due to the high prices. Don't do that. The bars are empty. Will try to score a fake ID for my 13-year old. I think they have to deny a lot of fans every year because of this same problem. It is very hard to get tickets to the NCAAs unless you can get them the first day they go on sale. Not trying to be insulting, but have you ever gone to D1's? I've been numerous times and I have never gone where I was not able to purchase tickets out front (legal or otherwise) if I needed to. You might end up sitting with another team's fans, but great seats are always available. That being said, I agree with the original post that Pittsburgh was a poor choice. It's an interesting slant saying that Pittsburgh is a poor choice due to the uprecedented high demand for tickets. PPG Paints Arena is not "too small". NCAA's haven't been held in Pittsburgh since 1957 - Dan Hodge won his 3rd NCAA title that year. Pittsburgh is arguably the hottest of hotbeds for wrestling in the US. The fact that a wrestling fan as knowledgeable as you is surprised by the demand at this venue is dumbfounding. It's absurd to say you shouldn't have an event where there is high interest. Constantly having it in that sewer of a town St. Louis, now thats a poor choice. I bought tickets at face value. You have to order at 10 am the Wednesday before NCAA's. There not the best seats, but I'm in and I will improve my seating once inside the arena. Complaining about ticket availability is absurd. How much were tickets at face value? Madison Square Garden every year. Best venue, best city, best bars, best food. Best city for promotional value and trying to grow the sport. Hotel prices don't get jacked up because it isn't even a blip on the radar in NYC. 50% of Finalists and AAs are from nearby states that you can drive in and save on airfare. Better weather than the midwest / great plains states . I second the vote for NYC. By far the best venue all things considered. If I attend another St. Louis Nationals please euthanize me. Another vote here for NYC. Great venue, no shortage of bars, hotels or restaurants. St. Louis has run it's course. I get it that it's easily to all of those in the midwest but there are plenty of fans in the rest of the country that would like to see it elsewhere. 41 NCAA's for me.....NYC was not even close to my favorite...just sayin'. And I know some will disagree...that's OK. The Venue is great, there were some great attractions, but my accomodations, ubering, places we ate....not the greatest....maybe our fault???? Personally, I do like St. Louis, and I've been there as a coach, done media, and as a spectator, so I've been on the floor, as well as in the seats. For me, Albany was my least favorite.....no floor space, hospitality rooms not very good. Rich.....I'll probably kick myself, but ETZ???? Acronym for ?????? Best time at nationals was in New York. Everyday the wife and I would leave the hotel in the morning and not make it back until that night. Almost missed session 2 because we were having so much fun at a bar celebrating St. Patricks day. Hope they bring it back with the next rotation. Glad it was in NYC........... And hope it is never there again. 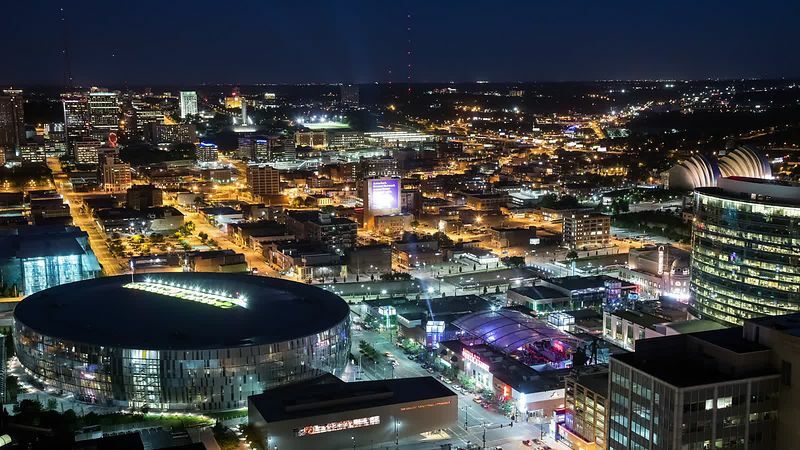 When it does head back periodically to the midwest, switch from StL to the Paris of the Plains, Sprint Center in Kansas City. Surrounded by the Power and Light district with 45 different bars and restaurants, plenty of hotel space, and 3 large venues within a 10 min. walk which would all be perfect for the NCAA Experience. Have been great hosts of the Big 12 wrestling and basketball tournaments and multiple March Madness events. KC hosted in 2003 at the historic craphole Kemper Arena. Sprint Center is a beautiful new(ish) facility right off the interstate and 15 min. from the airport (and you don't have to look over your shoulder every 20 sec. to make sure you don't get mugged).